Hold on to your hats, here we go. This is a large read, a luxurious read to snuggle down with on a cold winter's day (if we're ever going to get another of those here in the northeast), a great thumping Victorian melodrama mystery - my great big second helping of Wilkie Collins in two years. THE MOONSTONE (1868) is the story of a missing jewel (the moonstone is a diamond not...uh, a moonstone - it's just called The Moonstone) and the two thwarted and very misguided lovers who spend the entire book misdirecting everyone and generally making a nuisance of themselves. But that's Victorian melodrama for you. We kind of expect that going in. I suppose that Wilkie Collins - a contemporary of Charles Dickens - sort of, kind of, invented the mystery story as we've come to know it today, at least in Great Britain. (Edgar Allan Poe is credited with the American side of the invention.) 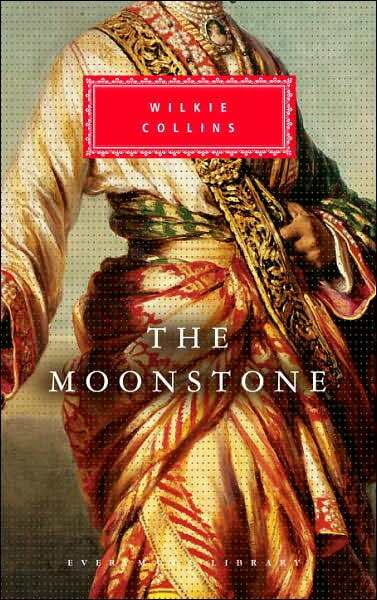 Having not been very familiar with Collins' work (except for a brief forgotten fling while I was in high school), I was pleasantly surprised by how much I enjoyed reading THE MOONSTONE, not to mention last year's WOMEN IN WHITE, which I also loved and recommend highly and heartily. You have to be in the mood, though, I will say that. In THE MOONSTONE, Collins practically invents the know-it-all detective with eccentric quirks though having done so, he forces him offstage about halfway through the story (we kind of miss him) only to have him reappear near the end (thank goodness since he kind of grows on you) in time for the grand denouement. Sergeant Cuff is a pragmatic, hyperactive fellow whose only love (besides crime solving) is roses and gardening. He almost immediately appears to know more about what has happened than anyone else on the scene - ah, genius. The scene being a large English country house and a fine cast of suspects all gathered for a young woman's birthday celebration. Among the celebrants, two young men with hopes, an argumentative doctor, and assorted others. Anyway, Cuff is eventually hired (in those days, oddly enough, you could hire a cop as you do a private detective nowadays) to find a missing jewel; the diamond known as The Moonstone. The jewel (cursed apparently since it's theft from the forehead of an Indian idol way back when) has been left to Miss Rachel Verinder (our heroine) by a spiteful uncle with nefarious purposes. She inherits the diamond on her birthday much to her chagrin and secret delight, but on that very night the jewel disappears from the not-too-hard-to- find hiding place in the heroine's boudoir. The next day Rachel and her stalwart and frankly rather callow beau, Franklin Blake, have a huge fight but nobody knows the reason why. Actually, not even the two young things know the reason why since neither will tell the other what in hell is going on and besides even if they did....well, you have to keep reading. But from that moment on Rachel becomes as intransigent as a young woman of her class was allowed to be and still keep her place in society. She refuses to see Sergeant Cuff when he arrives on the scene at her mother's request, refuses even to make any sense, refuses to cooperate with the investigation of the theft of her jewel. Cuff, naturally enough, is suspicious. Franklin Blake, also naturally enough, leaves the premises much confused by his girlfriend's behavior - which borders on hysteria - afraid to make things worse by staying. You can't blame the guy for shaking his head and wondering what on earth - besides the theft of the diamond - has happened. One minute everything's fine, the next minute his intended has turned into a termagant. Maybe he's had a lucky escape, I'd say. But no, Mr. Franklin is in love. He flees the scene to recoup and figure out what, if anything, is to be done next. In the meantime, Sgt. Cuff has his eye on a servant girl as a possible culprit. Rosanna Spearman is one of those tragic book characters you know will come to a bad end. She is an ex-con (not what they called them then, but there's no getting around it), who works below stairs at the Verinder house. Rosanna is trying to make a new life for herself though it's rather obvious she hates the work. In character Rosanna reminds me a little of the moody Sarah Woodruff of THE FRENCH LIEUTENANT'S WOMAN fame (the novel written by John Fowles set in Victorian England). Rosanna, who, besides being plain and insignificant also has a hunched shoulder (I mean, could she be any more pathetic?) and an aura of tragedy worn almost like a mantle. You see, Rosanna aspires. In those days, servants were not allowed to aspire. And to make matters so much worse, the sad girl has fallen in love at first sight with Mr. Franklin Blake. Uh oh. In truth, Rosanna is the third protagonist in the story, a character whose involvement in the outcome of the mystery remains unknown to Mr. Franklin and Miss Verinder (and to us) until nearly the end. But a character whose suspicious behavior immediately catches the eye of Sgt. Cuff. I might also mention that the Verinder country house is set on an ocean shore where, nearby, the gurgling of quicksand can be heard and if you're not careful, seen. Uh oh. I can say no more. Oh wait - there's one more thing I forgot to mention: the assorted group of sinister Indians in garb skulking about the outside of the Verinder house and in the nearby town pretending to be a harmless group of traveling jugglers. Okay, so there you have it. The gist of a story which, on the surface, doesn't seem to require the four hundred and some odd pages Wilkie Collins used to tell it all. But there you'd be wrong. THE MOONSTONE saga is revealed in separate chapters made up of journals and letters from several of the characters involved, all pertinent to some aspect of the story - so we get to view certain events from the viewpoint of Mr. Gabriel Betteredge, House-Steward in the service of Julia, Lady Verinder (Rachel's mother), Miss Clack, niece of the late Sir John Verinder (from whose malevolent beneficence the missing diamond sprang), Matthew Bruff, Solicitor of Gray's Inn Square, a narrative contributed by Mr. Franklin Blake the aforementioned confused young swain, the journal of Ezra Jennings, a narrative by Sgt. Cuff, a statement by Sgt. Cuff's man, a statement by a sea captain and finally a statement by a Mr. Murthwaite in a letter to Mr. Bruff. We also get a letter from Rosanna Spearman near the end which explains her part in the mysterious doings at the Verinder house early on. All of this makes it easy enough for the reader to form his or her own opinion of the sagacity, the honesty and/or the moral rectitude of those involved. The story takes place over a long stretch of time, about a year or so and the missing diamond leads, eventually to a dastardly murder and all other sorts of chicanery which, I suppose, leads us to the inevitable moral: when you spot a diamond (no matter how huge) on the forehead of an Indian idol, for goodness' sake leave it there. P.S. The Indian idol part of the narrative taken from Verinder family papers reminded me very much of the Arthur Conan Doyle, Sherlock Holmes story, THE SIGN OF FOUR written in 1888. See if you agree. P.S. P.S. Charles Dickens apparently didn't like the form Wilkie Collins used to tell the story of THE MOONSTONE, but I think it works splendidly. You just have to pay attention. I've never read this, but I'll get around to it someday. Funny you should mention curling up with a Wilkie Collins book, I'm hoping to catch up with "Woman in White" after the holidays when I anticipate having some breathing room in my schedule. Thanks for the insight on this richly told tale. Excellent review of a Collins' classic, as usual. Enjoyed it much, will share it with a friend. I know what you mean, Dorian. These are hefty books. But so worth it. Try THE WOMAN IN WHITE first, you won't be able to put it down. These books are really wonderful. Very much worth the effort. So glad you enjoyed The Moonstone, Yvette. It's more than just a landmark in the development of the detective story - it is, as you make very clear, a strong and thoroughly enjoyable book still very much worth reading. The form of the book - with successive narratives, each peeling off additional layers of the mystery - has been used successfully by other authors, including Michael Innes in "Lament for a Maker," one of my favorites. I hope other visitors here will try "The Moonstone" - you certainly give them good reason to do so! "leads us to the inevitable moral: when you spot a diamond (no matter how huge) on the forehead of an Indian idol, for goodness' sake leave it there"
LOL! You said it sister. I just a book which seems to be entirely inspired by Collins two most famous works. Review coming soon to you know where. Poor Roseanna Spearman. The ultimate tragic romantic figure in detective fiction. A woman, who like the protagonist in Tarchetti's Fosca, loves too deeply, too purely, and knows it will never be returned. Drusilla Clack is such a figure of mockery in this book. Very similar to another religious zealot in THE WOMAN IN WHITE, an old woman whose name escapes me. I gather Collins didn't think much of Bible thumpers. Great review. Glad you enjoyed it. And a great review it is, Yvette! I haven't read either of Collins' classics save for their two comic-book adaptations from Marvel and Classics Illustrated respectively. He has been credited with inventing the first detective though I'm not so sure about that. Must get round to reading THE MOONSTONE soon. I responded to Rosanna's plight - there really was no other way out for a woman with such deep feelings. I thought some of Collins' strongest writing was in the scene near the end when Rosanna's embittered friend deals with Blake in her own manner. Unfortunately I have an idea that Blake had no clue what was seething in that young woman's breast. Collins, as you know, led a very unconventional romantic life. He saved the exigencies of convention for his stories, I think. It took two attempts for me to get through this one, but once I finally got to it, I loved it. By the the way, I bought the edition that has this cover. I don't know that much about Wilkie Collins, but I think he had some understanding of women's inequality, even among the more privileged, and that he had sympathy. So, good for him on that score. Wilkie Collins lived with two women during a lot of his adult lifetime. Separate households. Had kids with both of 'em too if I'm recalling rightly. He was a real eccentric. He left them all properly provided for in his will which is more than a lot of men of the time did with their mistresses. Dickens wasn't happy that Collins didn't take pains to hide his unconventional lifestyle. Although late in life when Dickens dumped his wife and family for a young actress, he became the all time hypocrite.